I know a lot of what we cover here on This Day In History can be heavy, so we start the show out today with very special birthday wishes to the Tootsie Roll. Our love of chocolate hit new peaks today in 1896 when Leo Hirschfield sold his creation for the first time in a New York candy shop. Today, 64 million tootsie rolls are produced every day, made using the same recipe Mr. Hirschfield created in 1896. Most of us have heard of the Gutenberg Bible, the first printed book, and many of us believe that Johann Gutenberg invented the printing press. Well, neither are really true. The Chinese had been mass producing books since 1000, first using clay and wood and then with a metal press. Now, what Gutenberg did today in 1455 was to create a novel technology. He was the entrepreneur who configured a printing press that changed the nature of the availability of knowledge and access to books as never before. He changed the course of Western literature. And the Gutenberg Bible was the first mass produced book in the Western world using that technology he developed. It is 1836. The Battle of the Alamo begins. This is the stuff of legend: Davy Crockett, Jim Bowie and less than two hundred men make their valiant stand against the Mexican Army of Santa Anna. They all died in battle in their stand for freedom and the American way… Ok, let’s hold it here for a minute. A lot of that is true, but let’s rewind the clock. Americans had been flooding into Mexico for a decade, and Texas was then part of Mexico. One of the facts rarely explored is that these Americans coming to the Mexican province of Texas were slaveholders. One of the first acts of the 1821 Mexican Revolution, where Mexico won its independence from Spain, was to abolish slavery. The Americans coming into Texas refused to free their slaves and live under the laws of Mexico. 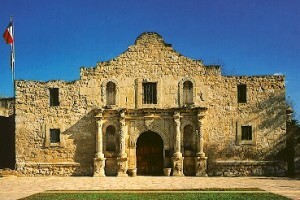 The Texas rebellion began its battle cry for Freedom: “Remember the Alamo!” So the story begins ..
Today in 1861, Baltimore was at the center of the plot to kill newly-elected President Abraham Lincoln before he could take his oath of office. President Lincoln was about to take a 2000 mile rail journey from Springfield, Illinois to Washington DC, celebrating his victory on stops along the way. Here in Baltimore, then the 4th largest city in America, a plot was hatching. A few months earlier in December, South Carolina declared it was seceding from the Union and that it would be the Palmetto Republic. Palmetto Societies sprang up across the South, and one of the strongest Palmetto militias was based here in Baltimore. Even though Lincoln had not yet uttered a word about abolishing Slavery, the South’s deep fear of Black liberation from slavery permeated the pores of what was to become the Confederacy. Pro-slavery men wanted to stop Lincoln from being inaugurated and plotted to kill him and take over the capital. The center of that was Baltimore, where a highly-organized plot to kill President Lincoln was being planned. The railroad brought in a man named Allen Pinkerton to run security and a man with deep Southern roots named Harry Davies was brought in to spy and thwart the plot. When Lincoln’s train got to Baltimore hours before it was scheduled, they thought Lincoln would make it through okay. But problems on the track delayed them and President Lincoln was stuck … hidden, but stuck. Just as dawn rose and the secessionist killers assembled, the train left the station and the plotters, who may have even included John Wilkes Booth, heard he had arrived in DC. Within months, Baltimore would have to be occupied by Union troops to ensure Maryland would not succeed and surround Washington DC. One of the most famous and significant American voices was born today in 1868 in the small town of Great Barrington, Massachusetts: William Edward Burghardt Du Bois. He graduated from Harvard, helped found the NAACP, and was the founding editor of their magazine Crisis. He convened the Pan African Congress and wrote the seminal work Souls of Black Folk, among dozens of other works of fiction and non-fiction. WEB DuBois died in Ghana in August 1963 when the attacks against him as a radical Black activist became just too overwhelming. >> It’s the birthday of William Shirer, who wrote The Third Reich, and the day the great English poet John Keats died in 1821. >> We lost John Kitzmiller in 1965. In 1957, he was the first Black actor to win Best Actor at the Cannes Film Festival. That may have been a pinnacle, but John Kitzmiller, who began life in Battle Creek, Michigan and served in Italy during WWII, decided that with his parents gone and racism rampant in the United States. he would stay in Italy. It was a place he fell in love with during the war. He went on to appear in 50 films, starting when he was discovered by the great Federico Fellini and went on to play Quarrel in the James Bond film Dr. No. He spoke Italian and French, among other languages. He passed away today in his beloved Rome. And another World War II veteran to return as an artist after the war was Hugh Lee Smith, who passed away today in 1999. He had a day job as a molder in the Ford plant, but what he was really was a painter. He taught Ann Ford, who was the wife of Henry Ford the 2nd, and John Stroh, owner of Stroh Beers, how to paint. His work was realistic, but haunting, like imagery on beaches, inner cities, and on balconies of families holding hands … He was one of America’s great unknowns, who you should get to know. Here’s a song for your February 23rd soundtrack. It’s a song we are all familiar with, but whose origins we might not be. In 1940, these words were written in a room at the Hanover House Hotel in New York City. “This Land Is Your Land” by the great Woody Guthrie.